When you think of Reed, you don’t usually think of Wall Street. But why not? With our long tradition of rigor, hard work, dedication, and talent, a surprising number of Reedies have pursued successful careers in the world of finance—pinstripes notwithstanding. Last month, the Investment Committee of the Reed’s board of trustees made an irresistable offer. Over spring break, eight lucky students—out of 20 who applied—would fly to New York City, all expenses paid, in order to get a better insight into the rigors, challenges, and culture of Wall Street. 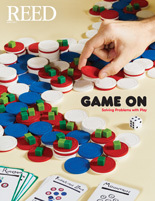 We spent four action-packed days meeting with bankers, hedge fund experts, and economic consultants. We also toured the NYSE trading floor and got to touch the Charging Bull, with Lady Liberty visible in the distance. This trip was one to remember. Our host was Jane Buchan [trustee 2009–], CEO of Pacific Alternative Asset Management Company, who welcomed us to Manhattan and gave us an overview of the banking industry and its opportunities for Reed grads. We also discussed the fascinating case study of hedge fund investor George Soros and his legendary 1992 bet against the British pound. The next day, we had lunch with journalist Peter Goodman ’88, who covered the economy for the New York Times, wrote an influential book on the underlying causes of the Great Recession, and now serves as the business editor of the Huffington Post. We also met Marc Malek ’92, who runs a hedge fund. In our meetings, it was clear to me the long-term effect that Reed has on its graduates. Within minutes we had eased into a conference-style discussion, engaging in friendly debate in a way that is hard to define, but is distinctly Reed. After a delightful reception at the home of Sandy Mintz [trustee 2006–] and other members of the Investment Committee, we headed back to the San Carlos Hotel to rest. 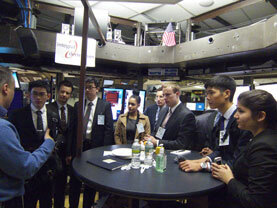 A highlight of the visit was a trip to the trading floor of the New York Stock Exchange. Walking into this monument to capitalism, you can still feel a buzz of electricity, either from the massive number of screens that fill the room, or perhaps the ghostly echoes of the bygone era of screaming traders. It’s quite apparent that the Exchange is a shell of its former self. High ceilings built to give space for the writhing, sweating masses to stay relatively cool, where men used to stand above to monitor the floor. Now that space is filled with screens, and the monitoring is done remotely. Nonethless, the Exchange is still impressive, even on this quiet trading day as news crews broadcast financial reports from the floor, and a constant stream of data fills every screen about us. The following day we strolled down Fifth Avenue, past the famous Apple glass square, to the commercial bank Merrill Lynch, where we were greeted by Soofian Zuberi ’93, head of global equity distribution. He treated us to lunch, shared insights about banking and the investment culture. Following that, we headed over to Avenue of the Americas to meet our first billionaire, Wes Edens, co-founder of the Fortress Investment Group. He treated us very well, and regaled us with stories of his experiences in Africa, building his new medical transport business, how he first founded his organization, and sent us on our way with two of his current favorite books, Deep Survival and Mountains Beyond Mountains to read. If I have learned one thing, it’s that there is no place, even the inner halls of capitalism, that cannot benefit from the heart, mind, and curiosity of a Reedie. Though we are not known for producing bankers, I believe the strong ethical foundation found in many Reedies can contribute to the integrity of the world’s financial system. And perhaps a few more dollars for the annual fund, to keep this beautiful place alive and thriving, and churning out the minds that shape the future.